Manta Ray S8018 21 W x 21 L x 18 H Toddler Mite by ChildBrite at Indsight. MPN: S8018. Hurry! Limited time offer. Offer valid only while supplies last. This Toddler Mite is 18'' high for your toddler classroom. Includes a 4'' deep Mega-Tray, 2 snap-on caddies, and a white plastic write-on/wipe-off lid. This Toddler Mite is 18" high for your toddler classroom. Includes a 4" deep Mega-Tray, 2 snap-on caddies, and a white plastic write-on/wipe-off lid. 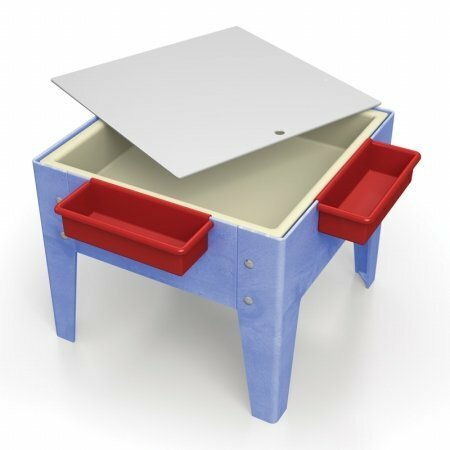 Available in blue, red, green, or sandstone table frame, email us with your color selection when you order. Comes ready to use. Dimensions are 21" Wide x 21" Long x 18" High. Use for Sensory and Manipulative Activities! If you have any questions about this product by ChildBrite, contact us by completing and submitting the form below. If you are looking for a specif part number, please include it with your message.